Burke Co. NC James L.
Robert and Elizabeth McCall arrived in America with their baby in 1775 and settled in York Co. near Gettysburg PA. It is said that Elizabeth was of royal descent, and had to elope with Robert who was a weaver by trade. Robert may have been escaping from a charge of treason after presenting the King with a tablecloth that had an American Eagle on it. About 1781, the family moved from York Co. PA to near the present town of Rocky Mount VA, in a part of Henry Co. VA that became Franklin Co. in 1785. Franklin Co. VA was formed in 1785 from Henry and Patrick counties (see present day map for location). Robert and Elizabeth moved to Burke Co. NC after all of their children were born, circa 1800. They lived first on the Catawba River near Lovelady Ford, then on Lower Creek near Hartland, Lenoir Twp., Caldwell Co. Robert is considered one of the early landowners in the area of Chesterfield, Burke Co. (now Caldwell Co.) NC. See History of Chesterfield. Daughter Jane (Jennie) was the first wife of Benedict Bristol. 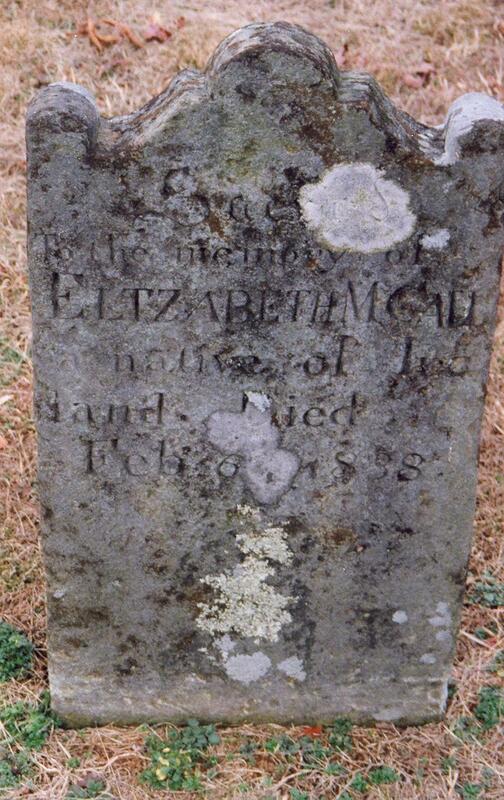 Daughter Elizabeth married Andrew Hull Tuttle who came with Benedict to NC in 1807/8. Son James L. married Catherine (Katy) Kincaid, the daughter of James Kincaid in Jan, 1830. Son Alexander married Jane Rector in 1812 and they had 10 children before he died in 1839. 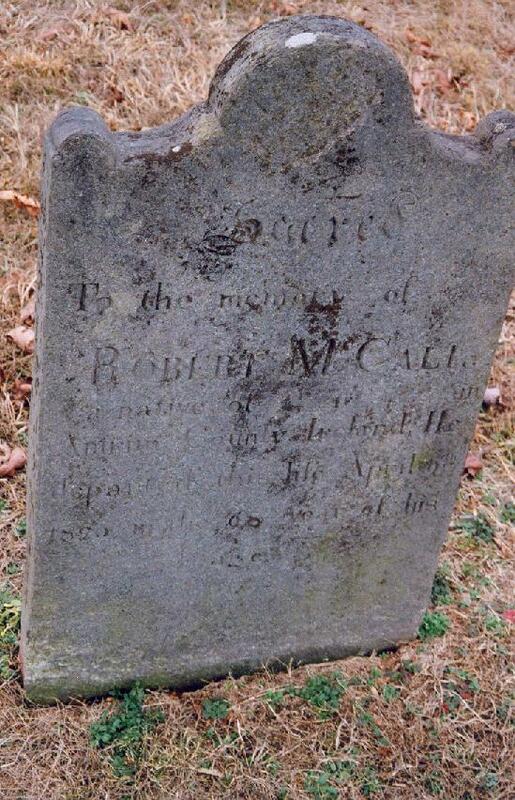 Tombstones of Robert McCall, and of Elizabeth McCall who are buried together in Littlejohn Methodist Church Cemetery in Caldwell Co., NC. Biography of Robert McCall submitted by Charles William McCall, D.D.S. for the 1981 Heritage of Burke County. Alexander, Nancy, Here Will I Dwell, The Story of Caldwell County, Rowan Printing, 1956, p.52. McCall, James L., The McCall Family in Ireland and America, Morganton NC, no date. Poe, Allen, "Lineage of the Bristol & McCall Families - Some Comments", typewritten, copy in possession of GN Holloway. 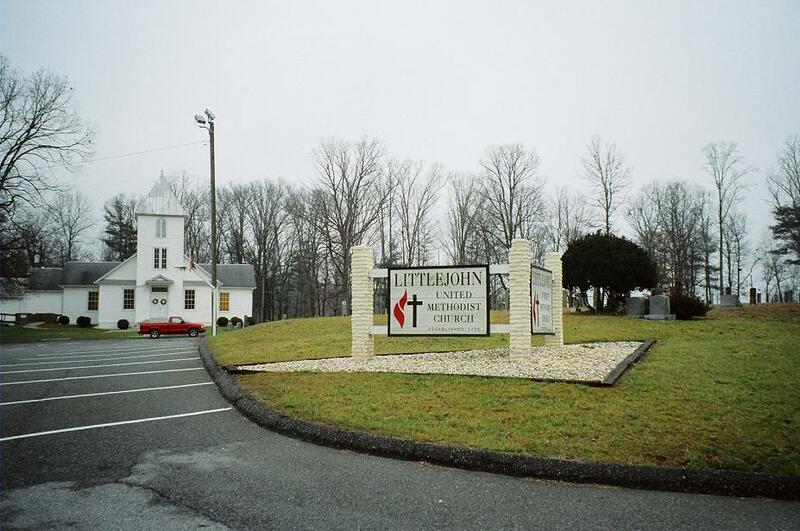 Tombstones, Littlejohn Methodist Church Cemetery, Caldwell Co., NC. WPA pre-1914 graves index, NC Archives, Raleigh NC.